An amazing cookbook filled with 50 delicious new ways to KETO while getting your nutrient-dense protein, healthy fats, and non-starchy veggies all packed in for the day. Make life a lot more scrumptious and a lot less restrictive by making your own soups. Your KETO Soup Bowl Cookbook shows you just how easy it is to do – there’s no complicated techniques or hours pouring over a hot stove here. For everyone wanting to feel fantastic without giving up taste, improve their health dramatically, and lose body-fat, this cookbook is crammed with delicious recipes for fat-burning, health-boosting, scrumptious bowls of goodness that will help in your quest for improved wellness and increased fat-loss while keeping your taste buds insanely happy. They are wildly nutritious. Proteins, healthy fats, and non-starchy veggies. These recipes are all KETO all the time, although your taste buds won’t believe it. There is no better way to get a ton of real, whole food goodness into your body. We love non-starchy veggies for the variety they bring to the proceedings! You can eat more veggies in soup form before you get full than if they were in whole form. If one of your goals is to cram more nutrition into your day, soups do it for you; not to mention that with soups you don’t feel like you’ve been munching on veggies all day long. You just feel like you’ve been slurping down deliciousness. They don’t taste like vegetables. At least they don’t taste like the vegetables you’ve been used to. With these soups you can eat things that you don’t like in real life. Cabbage that tastes like tortilla soup? Brussels Sprouts that taste like bacon? Cauliflower that tastes like rich cheese sauce? Yes! Please! And can I have seconds? They are simple and easy to make. Simple recipes that come together in a heartbeat and are easy enough for kitchen novices. Just learning your way around a kitchen? Start with soups! They are low maintenance. You can wander off and do something else while they are cooking. Dishes? Laundry folded? Done. Quick break with a cuppa? Done. They can easily be made in large batches. It takes almost no more time to make 16 servings than it does 4. Make a huge pot and enjoy effort-free meals for several days. They are freezable. Make large batches, freeze in portion-sized containers, and you have instant meals at your fingertips; except these instant meals are healthier than just about anything else on earth that you could eat. They are easily portable. Perfect for lunches, road trips or any time you need to have a tasty, nutritious meal on the go. They are fast and easy to reheat. A pan on the stovetop or a quick spin in the microwave, soups are reheated and ready to go in minutes. They are just as tasty cold as they are hot. Well, most of them. Some soups just need to be hot to make sense – like Chili – but others are equally as delicious cold. Soups aren’t just for winter anymore. They only need a spoon to eat them. Then, if finding a spoon is an issue, you can just drink them. Developed for people who are following any of the following lifestyles: KETO, LCHF, LowCarb, Paleo, SANE, Wheat Belly, Vegetarian, Vegan (with slight modification), Primal, Wild Diet, Bulletproof, weight-loss, gluten-free, grain-free, sugar-free, soy-free, diabetic, dairy-free (with slight modification), and many other dietary lifestyles. 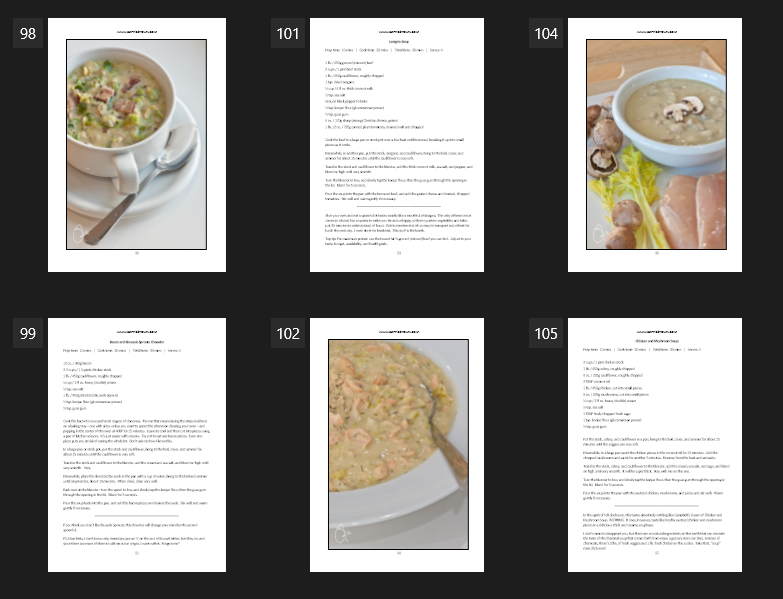 Get your DIGITAL download of The KETO Soup Bowl Cookbook right now and get ready to enjoy the best tasting and healthiest soup, chowder, gumbo, hodgepodge, stew, and gazpacho you’ve ever had! All recipes are free of sugar, wheat, grains, gluten, and soy. Many are also free of dairy and / or eggs – or can be easily modified to accommodate. …and many more, including Biscuits! “My husband has never cared for soup. He was less than thrilled to find me unwrapping a brand new soup cookbook. I promised him I wouldn’t make him try anything. Then I started with the Brussels Sprout Chowder. He tried it…. and went back for seconds! He conceded that I might just have found one of the few soups he likes. Next was the Creamy Cucumber Soup. Again, he went in for seconds. We discussed pairings with fish FOR NEXT TIME! After the Roasted Pepper and Smoked Sausage Soup, he admitted that I might be making him a soup lover after all.